Designing the Retroflyer took place over hundreds of hours. Involved working with several American manufacturers for custom parts and consists of over 100 components - all carefully assembled in our workshop. The end result is a truly high quality preamp and effect for the Fender Rhodes. With so many considerations and details to cover we thought it would be best to make a long form article to go into depth on some of the design hurdles, engineering considerations, manufacturing techniques and ultimately the sound of the Retroflyer. First you Retro-fit…then you Retro-fly! A hilarious tagline to be sure, but also the fundamental challenge in designing the Retroflyer was getting whatever we made to fit within the existing architecture. That left us with only 3 holes, one of which was immediately used by the output. To maximize the functionality we took the long journey of finding a good dual-concentric potentiometer. This allowed us to utilize 4 controls (plus two switches). Very few potentiometer fit the bill. And by very few, I mean basically none. Custom pots started reaching the range of $20/piece and we didn’t want our retail price point to be ruined before we even started. So instead, we found a slightly smaller pot by bourns and had some custom neoprene rings fashioned to fit these pots into the existing holes. To our shock, no one made knobs for these potentiometers! So we had those custom made as well. 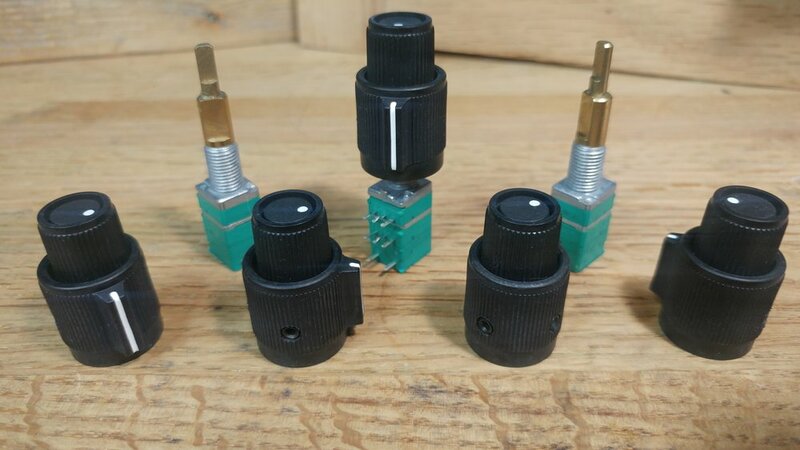 Bourns PTH series potentiometers with our custom USA made knobs thanks to our friends at Rogan. Special shoutout to Carole. Now that the controls had been sorted, pcb design, power and signal inputs needed attention. The most awkward aspect, even on the final version has been power entrance. There is no other access available to get under the lid. This was also an issue with the dyno-my-piano (active 1970-80’s preamp predecessor to the Retroflyer). So without a custom cheek block (which may come later as an add-on) we decided to give the customer a choice. One, drill a small hole in the fiberglass lid and install a socket. Two, file a small grove at the corner of the lid. Or three, simply sneak the cord along the rail. None being ideal but choosing one a simple necessity. To avoid possible strain on the pcb we opted to use a clip-mounted terminal on the pcb. So in the event the power cord is accidentally pulled the pcb won’t be damaged and the cord is also easily replaceable. In our opinion it’s never worth it for a company doing small-batch hand-made products to skimp on components. The labor is much higher than something that is mass produced and thus component cost is a much smaller factor. Plus, somewhat obviously, we wanted the Retroflyer to sound excellent! So no surprise that top-brow name-brand components are found throughout. Kemet, Nichicon, Panasonic, Bourns, Vishay, TexasInstruments and AnalogDevices, etc. But of course, components are worthless without proper design. Power: We expect a noisy power supply. Cheap, noisy power supplies are everywhere and quality power supplies are now extraordinarily expensive. So we added several power filtering features onboard including a mechanical relay, large capacitors, several stages of inductors and low-pass filters. We provide decent power supplies, but if you lose yours, you can feel confident in buying one off eBay for $10 and the Retroflyer still performing very well. Preamp: The Rhodes puts out an enormously dynamic signal, sometimes over 1 volt! Because of this we needed something with low-noise, and a very high headroom. The venerable TLE2072 is used, the modern version of the 072 you might find in much high-end studio gear from the 70s,80’s and 90’s. (and some cost-saving stuff made today) This is a nice JFET op amp with great noise, bandwidth and slew rates. But for those of you who are extremely discerning, all the op amps are socketed. So (with proper knowledge) swapping op amps is possible. High Pass Filter: Before we get too far along we should mention the high pass filter as well. The low end of the Rhodes can be very powerful. And whether you’re playing with a full band, recording in the studio, or just playing through a guitar amp - the amount of energy in a strong bass note can be too much. So while it’s not accessible on the front panel there’s one more way you can control your sound with the Retroflyer. An on board high pass filter with 3 settings. 20hz, 60hz and 130hz. It does wonders for cleaning up rumble and giving cleaner and clearer notes. Input Impedance: Much is made of meeting the Rhodes with a high input impedance. Perhaps because factory Rhodes so utterly failed in this respect. The importance and qualities of proper input impedance is a subject lengthier than even this article should approach. But in quick: typically input impedance is recommended around 10-20x the output impedance of any instrument. Our input impedance (exactly like the dyno-my-piano) is 330K. This is well beyond the standard protocol and more than enough to recover the missing tonal character lost to early passive and active circuits. For people claiming they need in excess of 1M input impedance there is likely more involved in whatever circuit they are using than this simple specification. EQ: The mid boost/cut offers a wide but very useable tone shaping circuit. With a Q of around 0.7 and 7db +/- the EQ gets a lot out of a single knob. When boosting, it allows the Rhodes best quality (its midrange) to shine through. This is great for cutting through during a solo or to help focus the sound away from where other instruments may conflict. The cut function gives a big, heightened full range sound. The Rhodes perceived volume follows very closely along the Fletcher-Munson curve of human hearing. This is generally a result of the Rhodes being mechanically linear…which is perhaps a silly way of saying the tone bars and tines are made in a linear fashion which then produces a (mostly) even amount of energy across the frequency spectrum. The human ear of course hears this quite differently and the mid-range appears pronounced. But cutting the mid-range you are essentially doing what a sonic maximizer or any “hype” style EQ does - which is compensating for the natural curve of human hearing but increasing these deficient frequencies and lessening the mid-range. Tremolo: Many people, thanks primarily to Fender, often confuse this for vibrato. Tremolos vary the amplitude, while vibratos vary the pitch. Many people highly regard the Peterson tremolo circuit of the early CBS and Fender model Rhodes. Others of course revile it. What it does is essentially make a sort of rounded off sine wave tremolo (many people refer to this as the cat’s eye tremolo) with the second channel being 180 degrees opposite, for a sort of ping-pong effect in stereo. Many people believe this style of tremolo was used to emulate the whirling of the then popular Leslie speakers. In fact Fender re-branded a rotating speaker design at one point in the early 70’s. Nevertheless, the tremolo effect combined with the Rhodes became it’s own classic sound. The Retroflyer uses two VCA (voltage controlled amplifier) chips in tandem to create a modern version of this stereo tremolo. With a rate of around 2-12Hz and depth from very subtle to complete chop. We round off the peak of the sine wave to achieve a similar overall shape to the cat’s eye while avoiding high-maintenance and/or inconsistent parts. Another major benefit with this VCA circuit is that it utilizes a full sine wave. Whereas more rudimentary circuits are reductive and simply use half of the whole wave. This is the main reason the Janus preamp will appear to drop in volume when the tremolo is engaged and also loses some dynamic range. Regardless, the Retroflyer contains a stable, low-noise, low-distortion, high-dynamic tremolo that just sounds great. The famous cat’s eye tremolo from the Peterson preamp. Note the opposite peaks and valleys. The best thing one can do for a Rhodes is, in our opinion, let the real sound shine through. This requires enormous headroom, proper impedance throughout the circuit and a preampfification stage capable of highly-detailed representation. Unfortunately the passive controls that came standard on hundreds of thousands of Rhodes have water-logged its sound and given the Rhodes perhaps an undue reputation for being tubby and flat sounding. The passive controls certainly lend a sound that excites very few people today. Even in regards to active preamps - the Janus design is nearly 50 years old and in many ways sounds the part. (although if you have one please don’t toss it, recap and upgrade the opamps and you’ll at least be a couple decades farther along!) In contrast, when listening to the Retroflyer you hear everything. Big full bass notes, complex harmonic overtones, a clear middle and the sparkle comes back to the high end. We’ve been recording Rhodes for years (straight harp, through various amps and with sundry preamps) and we were honestly shocked to hear how good the Rhodes can sound just running through the Retroflyer. We know there were cheaper ways to make the Retroflyer. And we know if we followed standard pricing formulas it should rightfully cost 50% more than it does. But a big part of this project was to make an active preamp that’s accessible and affordable for everyone. While providing a top-notch sound that belongs anywhere. So we cut cost where we could - if it didn’t hurt the sound or functionality. And we paid more for some things to have them made in America or simply made to a higher standard. Because we believe in doing that. And we believe our company can reflect our values down to each component. An off-center prototype from Detroit Etching. The same company that made the original Rhodes face plates over 40 years ago. Despite its flaws, Fender brought the Rhodes to thousands upon thousands of people. And while not perfect, this electromechanical keyboard continues to be relevant, desired and played. Back in the 1970’s Chuck Monte introduced the dyno-my-piano as a way to get the most out of your Rhodes. While not selling massively it was used in countless recordings and brought the Rhodes farther into relevance and renown. But the Rhodes, sometimes beyond belief, is still here and still being played today. We believe it needs a modern preamp. A preamp to help people get excited and stayed excited about their Rhodes again. To make it more usable, more recordable and more musical. I think we’ve done that and we thank anyone interested enough to read this all-too-long flight edition. Newsletter: We don't know when these will even happen but we guarantee they won't happen any more frequently than every four months or so. If you're interested they will contain our most recent tutorials, products and most importantly coupons. We will never ever sell your info. Sign up with your email address to receive news, updates and sales info.